R. John Wright was born and raised in Michigan, where he graduated from Wayne State University with a degree in liberal arts. After university, he settled in New Hampshire. While browsing in a bookstore one day, he came across a book entitled “The Doll” by Carl Fox. Intrigued by the photos of antique dolls, Wright began to contemplate a career in doll making. Two years later, he met his future wife, Susan, who had a degree in Fine Arts. The couple moved to Vermont in 1974 and John took a job as a clerk in a hardware store. When he was abruptly laid off in 1976, he turned to dollmaking. On a whim, he made his first crude doll out of the only material at hand – an old, pale yellow, flannel sheet (picture left). Although he had never sewn before, John quickly developed his skills. 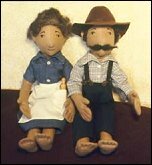 Within a week, he had made six rudimentary “hillbilly” dolls (picture below) out of flesh-coloured fabric. When he took them to a local crafts show, they instantly sold out. Over the course of the next year, he made over 100 of these primitive felt dolls. Operating out of their small apartment, retail orders began to pour in, and soon John and Susan had to hire assistants to help out. One year after he started, he sculpted the faces that would become his first molded felt dolls. By 1980, the “Little Children” series had been introduced, and the Wrights had set up a proper factory in Cambridge, New York with specialized machinery to increase production. In 1985, the first prototype of Wright’s classic “Christopher Robin and Winnie-the-Pooh” (picture left) was introduced, under license from Disney. This limited edition set is now worth thousands of dollars. R. John Wright is fascinated with capturing childhood characters in three-dimensional art. His versions of Disney characters – such as Pinocchio – and other legendary figures – such as Peter Rabbit (picture right), The Little Prince (picture below), and Paddington Bear – are stunning re-creations of classic artwork. The dolls are made of felt, in the tradition of fine dollmaking, as well as mohair and other top-notch materials. They are produced in small editions of the highest quality. Most come with a numbered Certificate of Authenticity. Although the dolls are expensive, they have an enviable record on the secondary market, often selling for many times their original value. Wright has won many awards over the years, including the Doll of the Year (DOTY) Award and the Golden Teddy award. The R. John Wright Collectors’ Club was inaugurated in 1996. It offers newsletters, a membership pin and access to Club Exclusive editions. Today, John and Susan Wright continue to head their innovative company, which operates out of an historic three story brick Victorian building in Cambridge. The couple oversees all phases of production which is still performed on-site, always stressing the highest quality in craftsmanship and integrity of design.